These were a big hit this weekend. Why? Easy and incredibly delicious. Preheat oven to 350. Warm pizza crust then place spinach all over the crust. Then shake on Gallopin’ Gourmet Shake to your taste, I’m pretty generous. 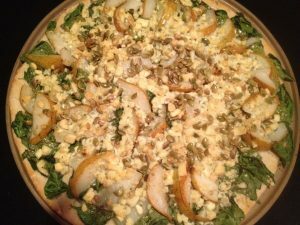 Put Gorganzola cheese crumbles all over the spinach and then top with thinly sliced pears. Put back in the oven at 400 until cheese has melted. Love it, just love it. Par bake the crust if you buy frozen. Scatter baby spinach over the crust and get it up to the edges if possible. Liberally shake Gallopin’ Gourmet Shake all over the spinach. Place the pears equally over the spinach and then sprinkle the gorganzola over the pears. Shake on pepita seeds if you wish. Bake at 375 degrees until the cheese melts. You are gonna love this one!